Allen met ARCHIE GRIFFIN today!! for the less sports savvy, that's an ohio state football player who happens to be the only two-time heisman trophy winner (1974 & 75) and who is now the president of osu alumni. allen's company prints the osu alumni magazine and archie came for a plant tour. so while employees were encouraged to wear osu apparel, they were also encouraged not to ask for autographs as this is a customer to be highly respected and all. so allen, of course the biggest osu fan in the entire company dons his osu polo, hat, and buckeye necklace. and swipes our osu welcome mat for his office doorway. and tacks his griffin jersey to his door (with a sharpie pen nearby in the slim chance of an autograph). and hangs buckeye necklaces and a huge buckeye hat on the doorknob. and just inside are his wooden osu football, bobbleheads, more necklaces, etc. your basic shrine to the buckeyes. so, allen's working hard at his desk, notices the entourage on the way, and waits in anticipation. to his dismay, they walk right on by and he's left dazed and confused. he half-stands, not sure what to do. then archie stops the group and looks back at his office. the plant manager laughs and says yes mr. griffin, this is allen, one of your biggest fans. so archie walks in and shakes allen's hand, crushing his knuckle with his huge heisman trophy ring. allen, being carefully professional says it's a pleasure to meet you mr. griffin. i'm the paper buyer, anytime you need anything, just call. all the while archie is checking out his office and picks up the wooden football (that i bought!) and says he really appreciates the display. 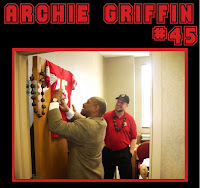 then archie points to his own jersey hanging on allen's door and says would you like this autographed? allen's heart flutters, and he picks up the nearby sharpie and says yes please! so another manager takes their photo and allen beams for the rest of the day, with constant visitors to see his coveted prize. now how cool is that? !